D. Vince Gill is a whore. I like Vince too...I was bummed. I'm not sure the Eagles ever even played in L.A. They were studio guys, and they were in L.A., but they were hardley an L.A. band. Yes, they were very successful...in a market where other music was banned from radio. They certainly didn't R&R. They have to have at least one song you like...! I'll go with the Joe Walsh inspired "Life in the Fast Lane" despite the Glen Frey and Don Henley gratuitously added writing credit after the fact. Kind of a performance fee to get on the record, LA style? "Take it Easy" adds Jackson Browne...I like Jackson Browne more than the Eagles in this genre. Gram Parsons died too young. EDIT: I think I like "Already Gone" the most from the early stuff, and again that was written by others, Jack Tempchin and Robb Strandlund. Don Felder sits in playing the solo, not a band member at the time. Well there is pre Walsh and Walsh era fans. But w/ the Eagles, I just didn't get the religion. It’s a sound that has never appealed to me though when I was in China theyd just discovered HOtel California (and would ask me to sing at each karaoke event. I could not sing this well) and I can appreciate that it is a beautifully crafted work. Take it Easy on the other hand lyrically does my head in . Is the song about trying to have an affair without your partner finding out ? “Lookin' for a lover who won't blow my cover, she's so hard to find” I’d suggest that writing a song with this reveal would raise suspicions with your partner. Rock, great, L.A. band, etc..... All labels that mean nothing. Either one likes their music or not. I'm a fan of their music whether they're overplayed, underplayed, or outplayed. Give me Poco any day. I like maybe a half dozen Eagles songs and most of the Poco stuff. One band far over-rated and the other far under-rated. Back in the day almost every commercial bar band was doing Eagles covers. Poco tunes were far harder to cover. If I never hear Take it easy, Already gone, or that Hotel song again, that'd suit me fine. If under interrogation, all my captors would need to do is play a loop of that lame harmony lead 'solo' and I'd crack within seconds. Damn! Ear worm started. I love Poco, but I'll take Pure Prairie League over either one any day of the week.... And they were from freakin' Ohio, no less. Craig Fuller was an underrated genius. Put me loudly and proudly in the Poco camp. Fantastic band that really generated most of my interest, what there was of it, in country rock music. I love Vanilla Sponge Cake, but if someone forced open my mouth and shoved sponge cake down my throat 20 times a day ,,every single day for the last 40 years I would HATE Vanilla Sponge cake. The Eagles ARE Vanilla Sponge Cake. LA_Manny wrote: "The Eagles ARE Vanilla Sponge Cake." That's highly unfair to Vanilla Sponge Cake (caps or not). I liked "Witchee Woman" in the early '70's, but I was an adolescent. I also liked "Little Willie" by The Sweet. Then I grew up. I laughed and laughed at/with the Dude in "The Great Lebowski." Question: What do you listen to when you've worn out your Creedence Clearwater Revival albums and don't have any more brain cells? Note: this is in no way a slam against any hard working musician/artist; if you can make a career in the arts, in any way shape or form, good for you. But it doesn't mean I have to like having it shoved into my ears, which is what radio was like in the '70's & '80's. Don't even get me started on journeybostonforeignerinc. My Eagles attitudes have been thoroughly ventilated on the GDP, and I need neither flog them again nor defend my feelings. I don't mind if a critic thinks they're greatest American (countryrockipopitan) band ever. I acknowledge that, at what the Eagles did, they were preternaturally and eerily perfect. I've had to play many Eagles songs in bands, and thought they were (a little) more fun to play than to listen to; I'd like to think it was because, in the process of butchering them bar-band-style, I felt more life in them. I don't own an Eagles album, and I'd never choose to listen to them. If they come on the radio and whoever I'm with doesn't mind, I'm likely to find another station. Years previous to the Eagles' breakout, I was enjoying late-era Byrds, Creedence, the Dead's countrier turns, Allmans, the Band, Pure Prairie League (and watching Craig Fuller in his previous band at my local Ohio swimming pool), and the Flying Burrito New Riders when they appeared. While the Eagles were flying high, I was more enamored of Little Feat and, yes, Poco (though never an avid fan) - and even Lynyrd. I concluded I had found the "country rock" that was meant for me. The Eagles were not aimed in my direction. No harm no foul anywhere. Taste is taste. We all got it. When we agree, we both have good taste. When we don't, mine is good and yours is bad. They were hopelessly corny...definitely no match for the Ramones. Are The Eagles are the greatest American rock band? Is Spandau Ballet are the greatest British rock band? Is there really a need to put superlatives on something this subjective? 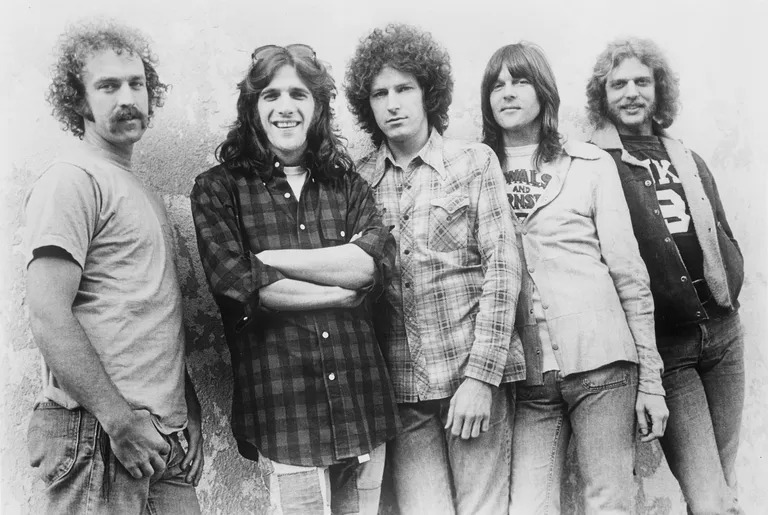 With the exception of Don Felder's guitar work on "Already Gone", for which I give him a pass on his role in causing "Hotel California" to happen, I never really understood the attraction of The Eagles. Their music, in the context of the time, represented, to me, a lot of what was wrong with rock in the '70s. What I saw at the time as self-absorbed, cocaine-fueled, navel-gazing repelled me just as much as did what I perceived to be the quasi-rock Kabuki-for-a-buck of KISS. They were two sides of the same Arena Rock coin to me then. I do owe them a debt of gratitude though, because they caused me to go listen to better music. In the context of its time, Spandau Ballet's "True" probably meant as much to that generation as did The Eagles "Hotel California" to the previous one, or Nirvana's "Smells Like Teen Spirit" to a later one. Hanging a superlative on any of them just to make a catchy headline for a concert review would work just as well, given the right audience. Like Proteus, I've enjoyed The Eagles music more as a player than as a listener, but that's kind of like saying that you like the comic strip "Garfield Minus Garfield" more than "Garfield". As I've said before, it's no use hating The Eagles - because no matter how much you hate them, you have to know that they hated each other more. That, in the end, is my answer to the question - The Eagles weren't so much a band as a group of solo acts, so they can't be the greatest rock band from anywhere. EDIT: Besides, everybody knows that Rock and Roll died when Elvis went into the Army, anyway. To me Joe Walsh was the only Eagle that poured heart and soul into the music, and I feel like most of the time he had tight reins placed on him by the rest of the band. They have this perfect quality that makes them bland. I havent laughed this hard all week,Thanks! I can't stand the Eagles. And I don't consider them Country, or Rock. As I young guy the Eagles seemed to come out at the same time as America. I thought America was w-a-a-a-a-y better, but they only did 1 album (?) and the Eagles just got bigger and bigger. That fact didn't cause me to like them any more. Like any group that puts out that much material, they have a couple good songs.